¡Juan Pablo II, te quiere todo el mundo! On the Eve of Divine Mercy Sunday and the Beatification of the Venerable Servant of God John Paul II, I prayed the Rosary with millions of people gathered in Rome, Lebanon, Tanzania, Fatima, Mexico, Poland, and across the globe, as we all honored the memory of this great pilgrim pope and saintly man. We heard testimonies regarding the great man of God that all call a saint, Pope John Paul II – the pope I grew up with and who had a direct impact on my faith and commitment to the Church. His closest associates and the Sister who was healed from Parkinson’s Disease through his intercession, spoke about the things I too saw in this great Pope: he was a man of deep conviction, entirely dedicated to Christ and His Church, in love with Christ and his Mother to whom he entrusted himself totally (Totus Tuus.) Pope John Paul II was a man of mercy; a man who went to Confession weekly, aware that we need God’s mercy and grace in order to be and to do good; a man who offered forgiveness and extended mercy to all, even his would-be assassin. This man was genuine, honest, free from all pretense, wearing no masks at all! He was an authentic witness to Christ. 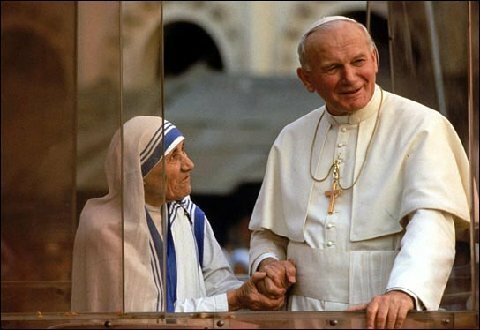 Blessed John Paul II revered the image and likeness of God in the human person and respected every man and culture. He understood well and deeply the command to go and make disciples of all nations, evangelizing all peoples while truly inculturating the Gospel message without in any way betraying that unchanging message of salvation; rather, he made sure that this timeless Gospel reached the ends of the world unadulterated but incarnated in the reality of the people it is meant to touch and change and save. He went in search of every human being by becoming the pilgrim pope of evangelization. Pope John Paul II loved young people. And they loved him back! 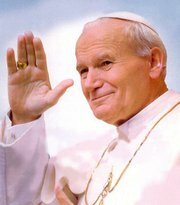 They chanted time and again: John Paul II, we love you! ¡Juan Pablo II, te quiere todo el mundo! Millions gathered for the World Youth Days he instituted and presided over. 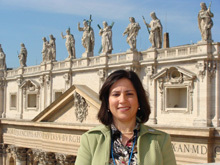 I attended World Youth Day in Rome for the Great Jubilee Year 2000: it was electrifying! To young people and people of all ages he cried out, from the very first moment he was presented to the world as the new Pope: Be not afraid! Open wide the doors to Christ! John Paul II was a man of deep conversion and deep prayer. Blessed John Paul II was indeed a man who prayed well and hard, daily, several times a day, for he saw prayer, communion with God, intimacy with the Holy One as essential, as crucial, a necessity for any who aspire to be all they, we, are called to be. This pope of the new evangelization was a great mentor and my model! I am still being touched by his words and example, and entrust my needs to his intercession as I seek new ways of facing the challenges and the opportunities for a new evangelization, one that includes a new catechesis, a new apologetics, and renewed pastoral care, aimed at becoming new men and women in Christ – new creations that can build together a new culture where the Gospel may flourish and lead to that new springtime for Christianity and that new civilization of love of which Pope John Paul II spoke so often. This new evangelization Blessed John Paul II foresaw – “new in fervor, new in methods, and new in expressions” – leaves no one and nothing out of its reach! How blessed we are to have known this great pilgrim pope of the new evangelization. May we follow in his footsteps as we honor his memory and ask the intercession of this saintly man of God, Blessed John Paul II, for fruitfulness in all our evangelistic endeavors.